NASA is commemorating the 50th anniversary of John Glenn becoming the first American to orbit the Earth with a series of special events spread out across the next two weeks. 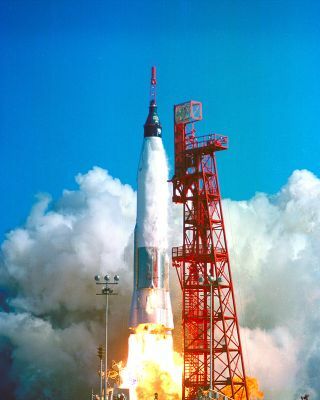 Glenn famously piloted NASA's Mercury capsule, called Friendship 7, on the agency's first orbital flight on Feb. 20, 1962. The astronaut circled the Earth three times on the mission that lasted a little over 4 hours and 55 minutes. To celebrate the 50th anniversary of Glenn's Friendship 7 flight, and to mark 50 years of Americans in orbit.The events can be viewed live on NASA Television, where users can also access more scheduling information. NASA has also put together an interactive online feature about the Mercury program and Glenn's Friendship 7 flight. This can be accessed at the agency's website here. 3 to 3:30 p.m. EST: Glenn and Carpenter will conduct a news conference in the Mercury Mission Control exhibit of the Kennedy Space Center Visitor Complex. 6:30 p.m. EST: Glenn and Carpenter will participate in "On the Shoulders of Giants," a ceremony at the Kennedy Space Center Visitor Complex honoring all those who made NASA's Project Mercury possible. The program will include remarks from Cabana, Senator Bill Nelson (D-Fla.) and astronaut Steve Robinson, who flew with Glenn on his second trip into orbit on the space shuttle Discovery's STS-95 mission in 1998. 1:30 to 3:15 p.m. EST: Glenn and NASA administrator Charles Bolden will speak live with the crew onboard the International Space Station to kick off the agency's two-day Future Forum at Ohio State University in Columbus. Glenn will also participate in a panel session, titled "Learning from the Past to Innovate for the Future," at the event. 3 to 3:15 p.m. EST: Glenn will deliver closing remarks at the NASA Future Forum. 1 to 2 p.m. EST: Glenn will deliver the keynote address at "Celebrating John Glenn's Legacy: 50 Years of Americans in Orbit" a special event hosted by NASA's Glenn Research Center at Cleveland State University's Wolstein Center in Cleveland, Ohio. The tribute will be included in a Tweetup hosted by the research center for its Twitter followers on the same day.